An adjustable dumbbell is a great fitness tool, especially for those with home gyms. It is a single dumbbell that has multiple weight capacities. So, instead of grabbing a new dumbbell pair when you switch exercises, you just change the weight to suit your needs. Adjustable dumbbells are available in multiple weight ranges (usually up to 100 lbs) and can be adjusted in various increments. You can buy a pair or even buy a single adjustable dumbbell and experience great training versatility. 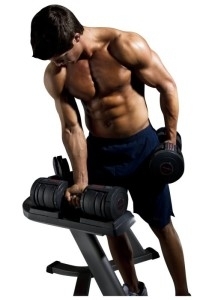 One of the main benefits of buying adjustable dumbbells is that they are cost-effective. 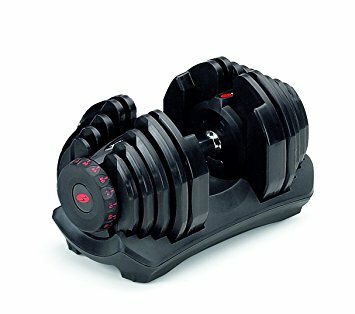 You can easily spend over $1000 to get a functional set of traditional dumbbells, whereas adjustable dumbbells can be bought for a fraction of that. Another huge benefit is the space factor. Adjustable dumbbells offer a space-saving option because you do not have to invest in multiple weights. Whereas a traditional dumbbell set requires a lot of wall space, adjustable dumbbells are literally one or two dumbbells that require little space. Finally, investing in adjustable dumbbells allows you to yield better results in your training. Why? The human body quickly adjusts to the level of resistance it works against. So, as you improve your strength and endurance, you must increase your resistance. A pair of traditional dumbbells does not allow for this, and you will have to keep buying new sets, which gets expensive. Your adjustable dumbbells allow you to vary your resistance and grow with you as you experience gains. Adjustable dumbbells and regular dumbbells both have respective benefits. But adjustable dumbbells are the clear better choice for home gyms. Adjustable dumbbells allow more versatility, take up less space, and provide a cost-saving option for consumers. And, you can do the exact same workouts with adjustable dumbbells as traditional ones. The only potential downfall of an adjustable dumbbell is that they take more time to use than regular dumbbells. However, most strength training regimes call for rest breaks between sets, so the extra time should not be a deal breaker based on the other benefits. Bowflex adjustable dumbbells come with a trusted brand name that’s led the fitness industry for decades. You can rely on the Bowflex brand to be well-made, long-lasting, and have strong customer support for any issues that may arise. 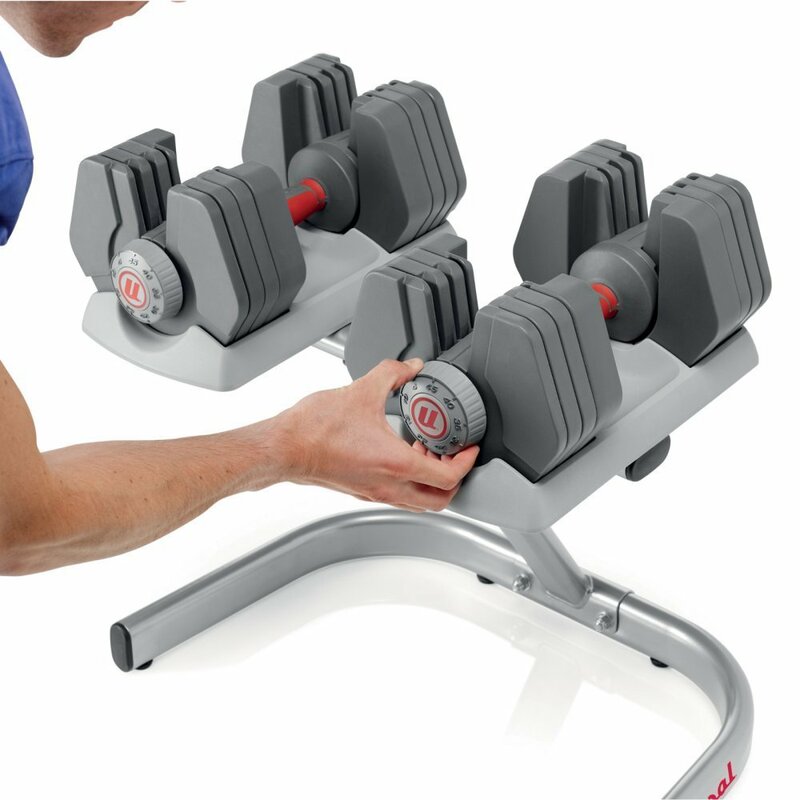 Bowflex adjustable dumbbells are typically round and use the dial-lock mechanism. Different styles come in different weight ranges, but that versatility makes for better options for consumers. The most significant fact about Bowflex adjustable dumbbells is how well they perform for both strength training and cardio conditioning. These dumbbells can be used for either and therefore, are a great versatile brand that can be used widely. Because Bowflex is such a strong brand name, you can trust that their adjustable dumbbells will be high-quality investments. 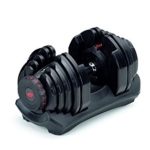 The Bowflex SelectTech 1090 adjustable dumbbell is a single dumbbell that features a dial lock. You need to buy two of these dumbbells if you want a set. A well-reviewed choice, the Bowflex SelectTech 1090 adjustable dumbbell offers great versatility in that it adjusts from 10-90 pounds. 90 pounds is significantly heavy, so these are great for heavy lifters looking to bulk up. The weight adjusts in five pound increments, so this product is better for those with some strength training experience. Despite having a round plate shape, the handle has more of a rectangular feel with some roughness to texture. Some users negatively reviewed that aspect, but it can be remedied with tape (or gloves) for sensitive hands. The lift-off of the Bowflex SelectTech 1090 adjustable dumbbell is quiet, and adjusting the dial lock is quick. This means that this product can easily be used for multiple training styles. It’s highly recommended that you buy an accompanying stand for this dumbbell, but you can improvise or use them off the floor. Another important thing to consider is that you should try not drop these dumbbells (or any dumbbells). If they are dropped with a lot of force, the plastic will break. Also, the bar is on the long side. This may not pose issues to you, but it can be uncomfortable if primarily using smaller weights. The warranty on this product is two years limited for parts, two years for plates, and one year for labor. This set of dumbbells is great choice because it’s versatile for multiple users, easy to use, and comes with good reviews and decent warranties. 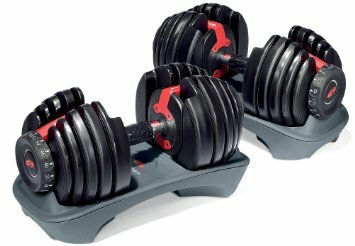 The Bowflex Select Tech 552 adjustable dumbbell is a pair of adjustable dumbbells. It features a dial-lock system that is well-reviewed for its pleasing cosmetic design and ease of adjustability. Each dumbbell in the Bowflex Select Tech 552 adjustable dumbbell pair adjusts from 5 to 52.5 pounds. You can easily adjust the dumbbells in 2.5 pound increments up to the first 25 pounds. After the first 25 pounds, it adjusts in 5 pound increments. So, the Bowflex Select Tech 552 is an excellent choice for beginners or for those who want to gradually increase their strength. Because of the rapid switch ability, this set is great for those doing high-intensity aerobic conditioning. If you’re looking to solely focus on strength training, the Bowflex Select Tech 552 adjustable dumbbells may not be heavy enough for your goals. 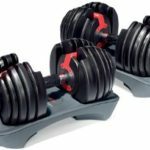 Like the afore reviewed Bowflex dumbbells, the Bowflex SelectTech 552 adjustable dumbbells aren’t made to be dropped. This means that lifting to failure may not be an option for you. Also, this set does not come with a stand, but it does come with a tray to place the weights in. The Bowflex SelectTech 552 comes with a good warranty: two-years on plates and parts and one year on labor. 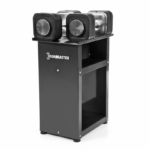 Although the Ironmaster brand may be less recognized than Bowflex, the Ironmaster adjustable dumbbells are an excellent product. They are designed with a unique square shape so the dumbbells won’t roll when you put them down. 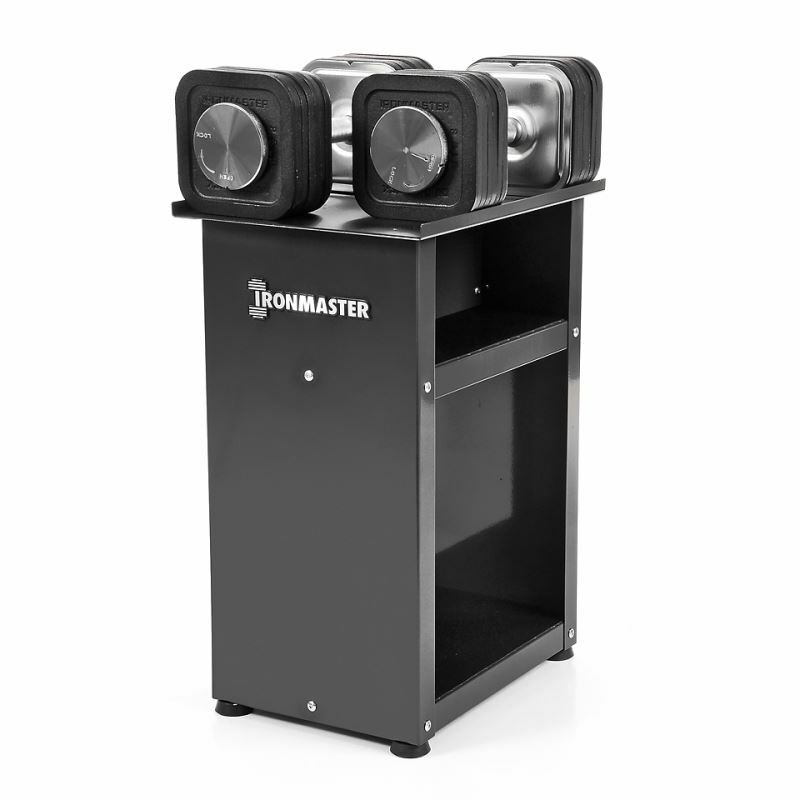 Ironmaster adjustable dumbbells also come with a stand for easy storage and take up a minimal amount of space. One of the best factors about Ironmaster adjustable dumbbells is that they aren’t made with any plastic or cheap parts. This is great news for heavy lifters, as you can lift to failure and drop the weight if needed. Also, Ironmaster wants to ensure their customers get a great deal. The Ironmaster adjustable dumbbells come with a lifetime warranty! The Ironlock Quick-Lock Adjustable Dumbbell is a pair of dumbbells that makes an excellent choice for those focused on strength training. One really cool feature is that it takes up less than two square feet of space. Another major perk for this set is that the bar is only as wide as the amount of weight you are using. This feature helps to maintain pristine form. The weights do not shift or move around once they are tightened. This is thanks to the unique design, which makes them feel balanced regardless of the amount of weight on them. 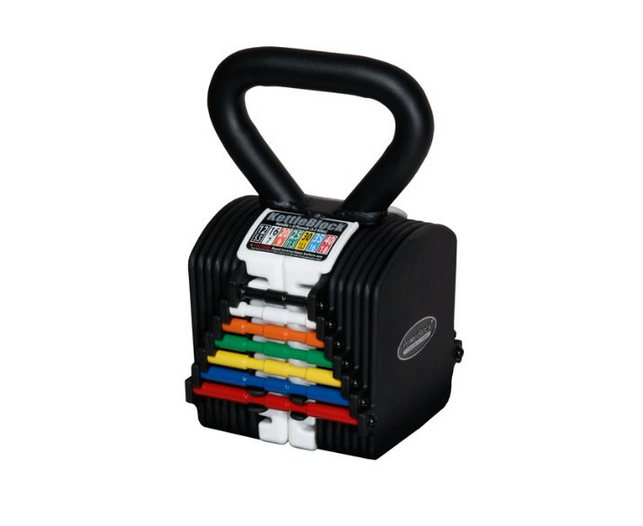 Given their sturdy construction, the Ironlock Quick-Lock Adjustable Dumbbell can be dropped. This pair of adjustable dumbbells is awesome, but keep in mind they take more time to change the weights. Powerblock adjustable dumbbells are extremely cost-efficient. 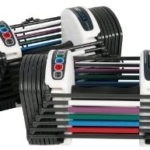 They are priced much cheaper than other adjustable dumbbells, without costing quality. The Powerblock brand is made with minimal plastic, so they hold up for longer time and use. The Powerblock adjustable dumbbells come in a selector-pin style, so changing the weight is quick and easy. Another unique brand feature is that the weight sets are expandable. You can start with a basic model to see how you fare, and then buy more weights at a later time. The shape is another unique feature. They are designed in a tower-like square with shorter handles, so lifting won’t be cumbersome. Finally, Powerblock adjustable dumbbells come with a 10-year warranty so you can feel good about your purchase. The Powerblock Sport Adjustable Dumbbell is a fantastic choice for beginner lifters or those who like fast-paced aerobic conditioning or circuit training with limited added resistance. The Powerblock Sport Adjustable Dumbbell is a pair of adjustable dumbbells that goes up to 24 pounds in each dumbbell and adjusts in three-pound increments. Obviously, because of the light weight capability, this set is not the optimal choice for heavier lifters or those focused on strength training. The small size of the Powerblock Sport Adjustable Dumbbells allows users to perform conventional exercises without sacrificing form. (Do note that if you plan to expand with the larger Powerblocks, the added bulk and length could cause concern.) Additionally, in regard to the small size, those with large hands may struggle to get a good grip. The handle does come with padding to help protect the wrists, especially during overhead lifts. Another perk of the small, square design of this set means they’re space savers because there’s more weight in a smaller place. The set also comes with a stand for easy, convenient storage. From a safety perspective, the Powerblock Adjustable Sport Dumbbell is safe and rugged. It uses a magnet mechanism with the selector pin and has a backup elastic band to prevent plates from falling. But, this does not mean that nothing can go wrong. You have to ensure that you insert the pins straight across and the pin mechanism right side up so that the magnets engage and hold the pins together. Another less-than-ideal aspect of this set is that they do tend to rattle and make some noise during use. But for the price point, that can definitely be overlooked! Remember that they aren’t very heavy, so rattling on this set sounds much different from rattling on a 90-pound set. Another benefit for the Powerblock Adjustable Sport Dumbbell is that even though it’s well made, it comes with a 10-year warranty. You can’t go wrong from an investment standpoint! 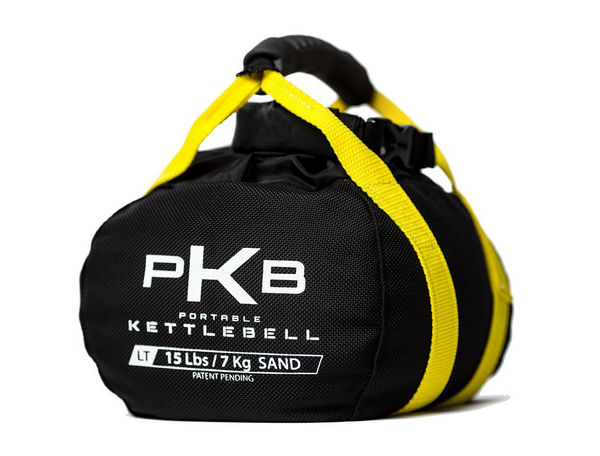 Bottom-line, this set may be lightweight, but it’s an excellent starter set or choice for those who do circuit training. Universal PowerPak Adustable Dumbbells may not have immediate brand recognition, but their parent company is Nautilus. When you hear Nautilus, you likely think of top-notch equipment thanks to their strong fitness reputation. This is a huge perk for Universal PowerPak Adjustable Dumbbells. Nautilus is exceptionally committed to customer satisfaction and stand by that commitment with lengthy warranties on most products. You can trust that you’re getting a great product. Additionally, these dumbbells are well-designed for minimal rolling or rattling thanks to their hexagon shape. Not only are the dumbbell sets ergonomically designed, but Universal Powerpak Adjustable Dumbbells also offer an ergonomically designed stand. The Universal PowerPak 445 an awesome choice for faster-paced workouts, like P90x or other circuit training programs. The Universal PowerPak 445 offers a set of two adjustable dumbbells that go up to 45 pounds in each dumbbell. They adjust in five-pound increments, so be sure to have some weight lifting experience to accommodate for less gradual gains. For seasoned weight lifters or those working toward major strength goals, this set may be too light for you. The Universal PowerPak 445 definitely has the most design-conscious impact behind it. Everything from the grip, to the plates, to the stand is ergonomically designed. Note that the stand is included with the purchase. The Universal PowerPak 445 relies on a dial system to adjust the weights. But, it’s not a standard dial system. Instead, the manufacturer uses a proprietary locking system for safe, sturdy workouts. This also accounts for minimal shaking/jiggle when using the dumbbells. The dial system allows for quick, easy adjustments of the weight. This makes the Universal PowerPak 445 an awesome choice for faster-paced workouts, like P90x or other circuit training programs. With all of the great things going for this adjustable dumbbell set, there are a few critiques to be mindful of when purchasing. The first is that this set has a bigger footprint than its competitors. The stand has a long and wide base, which is what takes up the most space. Another slight critique is that the plates can slide a little during fast movements. This can be mitigated with a focus on controlled movements and proper form. These negatives should not be considered deal breakers. 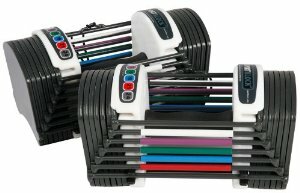 The Universal PowerPak 445 is a high-quality set of adjustable dumbbells that will serve the consumer well. Adjustable dumbbells, on average, top out at about 50 pounds each, which is 100 pounds for a pair. There are some brands that have higher weight options, so be sure to look at the reviews. Most dumbbell exercises do not require extremely heavy weight, with some exceptions like dumbbell bench press. If you are looking to bulk up or body build, then you should opt for heavier adjustable dumbbells. But if you are a fitness enthusiast who does basic training, a regular pair of adjustable dumbbells will work fine. You should also consider your current fitness level and be sure to choose a weight range that will grow with you but not be too heavy. The number of weight settings on an adjustable dumbbell is important when thinking about how you’ll exercise with them and/or if you’ll be sharing them. For example, a husband and wife couple may have very different training goals, therefore needing a wide range of weight settings. A single person who is focused on a specific training goal might need less range/settings. The increments in which you adjust weight on adjustable dumbbells is an important factor based on training goals. Most adjust in 2.5 or 5 pound increments. If you are a seasoned lifter, then you may be turned off by a small increment and consider it a wasted feature. However, fitness beginners can greatly benefit from a small increments on their adjustable dumbbells. This type of adjustable dumbbell is pretty basic and simple to use. You just turn the dial to that amount of weight you want to lift, lift the dumbbell, and the amount of weight that you chose is attached. The remaining plates stay in the adjustable dumbbell holder until you’re ready to make another adjustment. The functionality and ease of use makes a dial type ideal for those who want speed and versatility for both cardio conditioning and strength training. Because dial-type adjustable dumbbells are the easiest and most convenient, they can be pricey. The more traditional option, a spin-lock consists of multiple weight plates that stay together with a lock that spins. You basically load up how much weight you want on either side, and then twist the metal lock until it is tight. So, the spin-lock adjustable dumbbell is a great option for strict strength-trainers, because it requires more time to adjust. If you’re doing a lot of aerobic conditioning, the amount of time to adjust the spin lock could be a downer. But, the perk of this style is that it’s usually the most affordable. Similar to the dial option previously discussed, a selector pin does not require manual adjustment. All you have to do is move the pin to select the desired load for the exercise you’re doing. Any unwanted weight remains in the holder. The selector-pin style adjustable dumbbell is as the middle ground for convenience and affordability. But the trade-off is that they are not the sturdiest option. Some users have experienced the weights coming loose during high-intensity workouts, so selector-pin adjustable dumbbells may not be best for fast movements. Determining whether you need a pair or an individual adjustable dumbbell also depends on how you will be training. An individual dumbbell may be more limiting, but you can still do many exercises with a single dumbbell. The obvious perk to buying one dumbbell is the lower cost. It also may be a strategic decision to get a feel for using adjustable dumbbells. Round dumbbells will roll when you set them down. So, if you are doing fast-paced workouts, you will be better off to look for square, octagon, or hexagon shaped adjustable dumbbells. This applies to whether the adjustable dumbbells are quiet or if they rattle around during use. Clanking dumbbells may give an adrenaline rush, but they may not be practical (especially if you live with others). The best adjustable dumbbells have an ergonomic grip/handle. This means that there is plenty of room to fit a variety of hand sizes on the dumbbell. The grip should be sturdy enough so the weights don’t get slippery from sweat. Various styles and weight ranges mean there is a myriad of dimensions when it comes to buying adjustable dumbbells. Consider how much space you have available and whether you’ll be transporting the dumbbells. Some adjustable dumbbells require a stand for storage, so be sure to look for that important detail. More importantly, check as to whether the stand is included in the purchase or if it’s an accessory that is sold separately. A good warranty is always a perk. When you invest your money, you want to have peace of mind that you’ll get a long-lasting product. Be sure to find a warranty that is fair for the price you pay. An adjustable dumbbell is used for traditional strength training exercises, like curls, rows, and lunges. You can actually get a full body workout with an adjustable dumbbell. Anything you can do with a traditional dumbbell can be replicated with adjustable dumbbells. You can perform isolated muscle exercises with adjustable dumbbells, or you can do more functional exercises like deadlifts. There are literally hundreds of exercises you can do with adjustable dumbbells, and the load flexibility adds even more possibilities to your training.